They’re artists, they’re local, and they’re women. “Lady Parts”, on display in Newport, Kentucky in the gallery at the Southgate House, is an all female art exhibition focusing on bringing women together in celebration of their art. Sara Relojo, a graduate student from Hebron, Kentucky, organized the show, which opened June 3, with the hopes of giving exposure to fellow female artists. 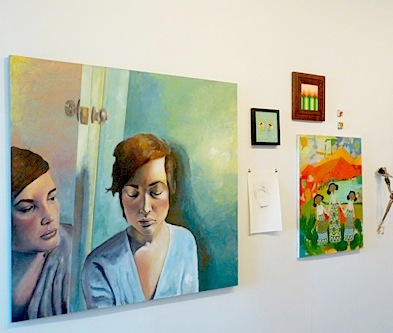 With over 14 artists exhibiting in the group show, including Andi Martin, Andrea Bellen, Arynn Blazer, Didem Mert, Elise Thompson, Emily Lind, Jacklyn Howard, Kate Dube, Lauren Mira, Michelle Eikenbary Calis, Molly Donnemeyer, Monica Brewer, Sara Relojo, Tilley Stone and more, there is a wide variety of artwork to keep the artistic palate satiated, including painting, drawing, photography, printmaking, and mixed media. Southgate House via phone at (859) 431-2201.